On the morning of December 6, 1917, two ships, the Imo and the Mont-Blanc, collided in the Narrows of Halifax Harbour. The Mont-Blanc was a munitions ship on its way to join a convoy sailing to war-torn Europe. The cargo of the Mont-Blanc caught fire, and after burning for 20 minutes, the ship exploded. The blast ripped through the city killing almost 2,000 people, injuring thousands more and causing widespread devastation in Halifax, Dartmouth, and the Mi’kmaq community of Turtle Grove. 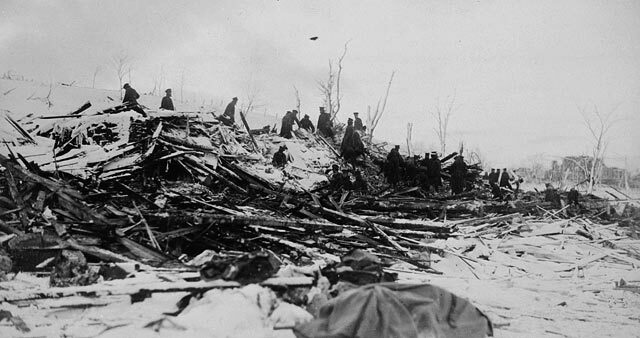 The “Halifax Explosion” as it became known, brought the danger and destruction of the First World War home to Canada, and left an indelible mark on the city of Halifax. Library and Archives Canada (LAC) holds various records that tell part of the story of the Halifax Explosion, its aftermath, and the relief work and investigations following the disaster. The first place to look is LAC’s thematic guide, Halifax Explosion. Some of the records listed in the guide are available on digitized microfilm reels on the Héritage website. Other records are available for onsite consultation at LAC. The guide primarily lists records about the disaster and its aftermath kept by the Canadian federal government. This includes records such as the formal investigation into the collision of the Imo and the Mont-Blanc conducted by the Dominion Wreck Commissioner (RG42, Vol. 596 and RG42, Vol. 597). 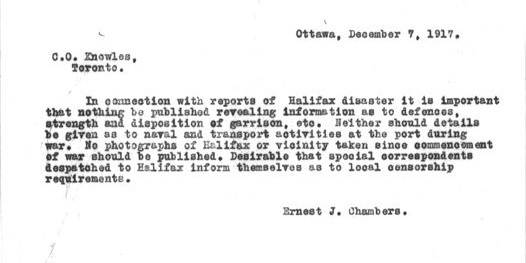 There is also correspondence of the wartime Chief Press Censor, Ernest J. Chambers (RG6, Vol. 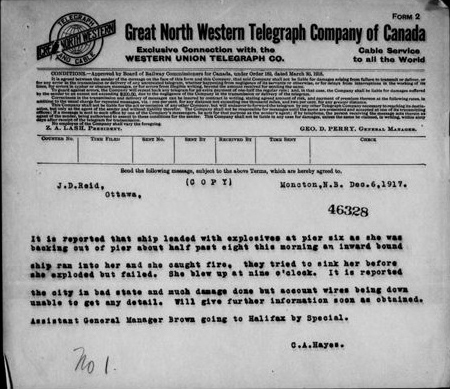 621, File 350, Microfilm reel T-102) that documents both the urgent need to report news of the disaster accurately, but not to reveal any information about the defences of Halifax Harbour. If you are looking for images, try LAC’s Flickr album of digitized photographs taken after the Halifax Explosion. LAC also has a more detailed description of the explosion at First World War: Tragedy on the Home Front. 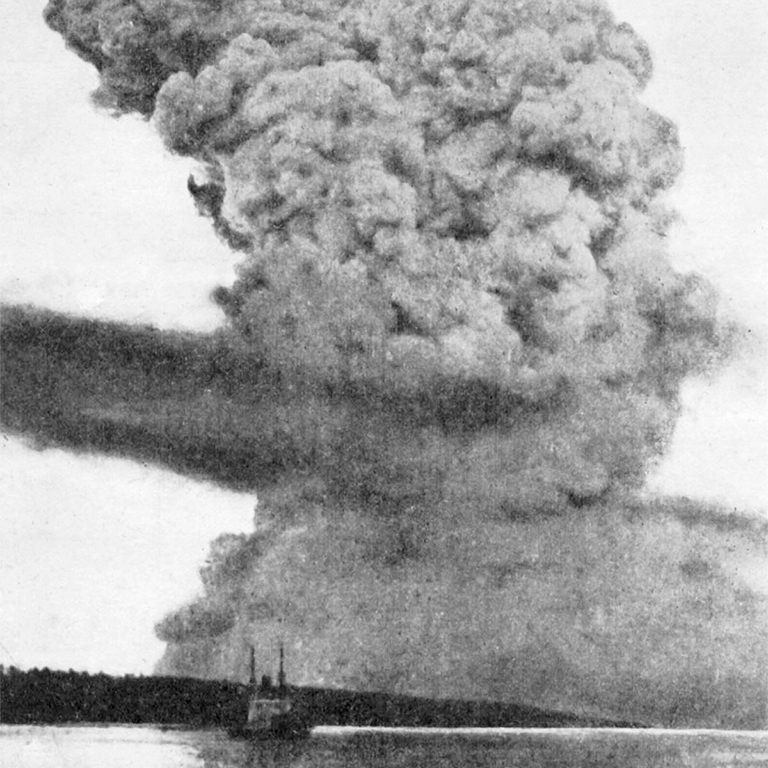 You can find more records related to the Halifax Explosion by searching the Archives database for the keywords Halifax AND explosion OR disaster; or try searching for other keywords related to the disaster. You can then limit your search results by date, or by the type of material (i.e., photographs or textual material). The records at LAC come from the Canadian federal government and from private individuals and organizations. Some records are available online, and others are available for onsite consultation by visiting in person, or by ordering reproductions. 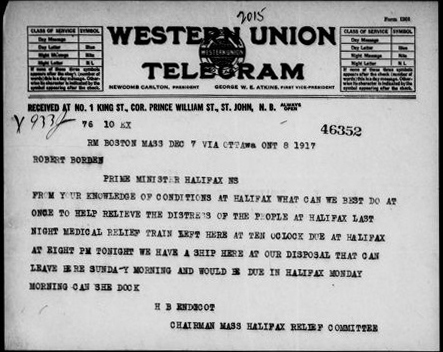 There are far too many different records about the Halifax Explosion to mention them all here, but correspondence in the Sir Robert Borden fonds (MG26-H) tells one small part of the story. Sir Robert Borden was the Prime Minister of Canada and the Member of Parliament for Halifax at the time of the explosion, and his papers include telegram messages giving news of the disaster, messages of sympathy for the people of Halifax, offers of assistance, and more. To find records about the Halifax Explosion in the Sir Robert Borden fonds, search the Archives database for the keywords MG26-H AND Halifax AND explosion. You can also review the finding aids for the Borden fonds, available as PDF documents in the “Finding aid” section of the fonds description (scroll down). 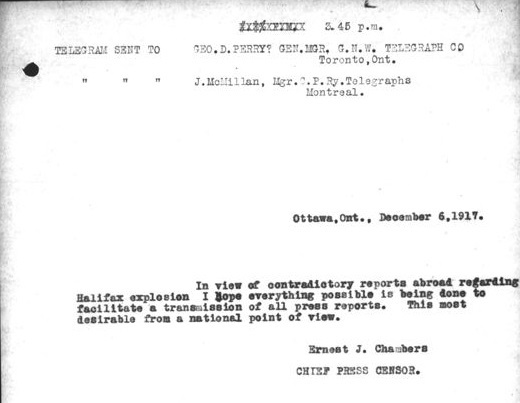 Much of the correspondence related to the explosion is in the file “Halifax Disaster 1917–1918” (MG26-H, Vols. 89–90, Pages 46309–47016, microfilm reel C-4325, which is available on the Héritage website, starting at image 301). Ordering documents: what numbers do I need? Valerie Casbourn is an archivist with the Regional Services and ATIP Division at Library and Archives Canada.